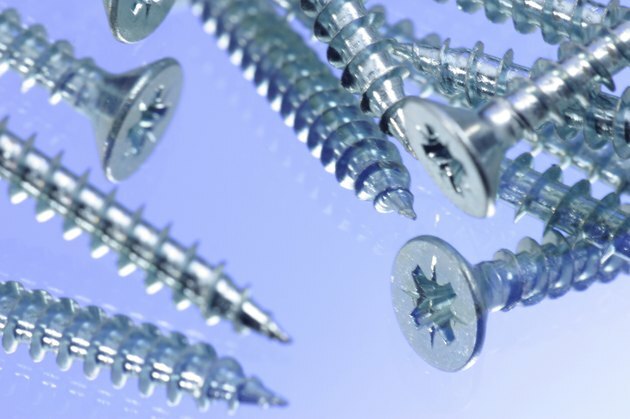 What Is the Difference Between Wood Screws & Drywall Screws? Hundreds of different types of screws can make figuring out which one to use for a particular job a little overwhelming, but matching the screw to the job is critical for a successful project. Screws are named according to what material they are intended for: Drywall screws are used for fastening sheets of drywall to the wood or metal framing for a building. Wood screws are used for fastening pieces of wood. These stainless steel, flat head wood screws are used with either a slotted or a Phillips head screwdriver. Wood screws are made of zinc-plated steel, stainless steel, silicon bronze (used mostly in boat-building and restoration) and brass (usually chosen for its decorative appeal). Drywall screws are made of case-hardened steel. They are usually black, due to a black phosphate finish on the steel. Wood screws are numbered from 0 to 20, indicating a diameter from about 1/16 in. to 5/16 in. The length of wood screws is measured in inches and fractions of inches and ranges from approximately 3/4 inches long to 4 inches. Drywall screws are available in sizes 6 to 10, with the size indicating threads/per inch. The length of the drywall screw suitable for a particular job depends on the thickness of the drywall. For hanging 3/8-inch to 5/8-inch thick drywall on wood studs, 1-1/4-inch long, #6 coarse thread drywall screws would work well. For installing 3/8-inch, 1/2-inch or 5/8-inch thick drywall on steel studs, the drywall screws should be 1 inch long. Wood screws are available with a variety of heads which correspond to the type of driver needed to install them and the use to which the screw is being put. Slotted-head and Phillips-head screws correspond to slotted (straight) and Phillips head screwdrivers. Slotted screws and Phillips head screws come with flat heads, oval heads and round heads. Flathead screws are countersunk below the surface of the wood, and the hole is filled with a dowel or wood putty. Oval head screws are not countersunk and the oval head gives a more finished look to the project. Round head screws protrude above the surface of the wood for a decorative effect. Drywall screws have bugle heads, which are set a little below the surface of the drywall, with the holes filled with joint compound when the drywall is finished. Drywall screws for trim have a flat head that fits a Phillips head screwdriver or a flat head that fits a square driver. Wood screws usually require a pilot hole to get them started, although some wood screws, like all drywall screws, have very hard, sharp tips that make them self-starting, or self-tapping. Self-tapping screws do not require a pilot hole; they are driven directly in the material with a manual screwdriver or electric driver. What Is the Difference Between Wood Screws & Sheet Metal Screws?